VALLEY — The first day for this year’s District Master Games were hosted at the Valley Community Center on Friday morning. The games are held every summer for senior citizens to compete against one another in a multitude of sports. Dominoes, the basketball throw and the softball throw are just three of the games that were played during the day. Participants who earned a medal at district games received a trip to go to the state games. This year and in 2019, Valley will host the state games, according to Senior center manager Ron Fancher. Approximately 700 to 900 seniors compete in the state games every year. 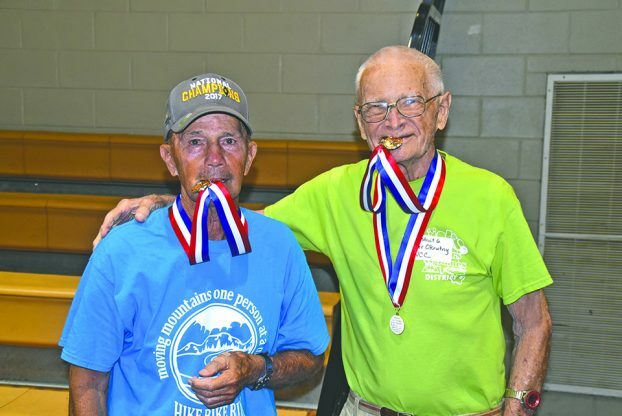 There were six 90-year-old-plus participants in the community center this year and 30 senior participants overall compared to the 16 participants from last year. One 90-year-old plus participant is Walter Okrutny, a 96-year-old man who’s participated in the master games for many years now. Okrutny doesn’t face much competition nowadays he said because there aren’t that many 90-year-olds who are in the same physical condition as him. Whether he’s facing competition or not, all participants end up winning in life, according to Fancher. When Fancher first took over the manager responsibilities four years ago, the first event he attended was the state games in Oxford, Ala. At the games, he saw a 98-year-old woman playing shuffleboard. Although the near-centennial was unsuccessful getting past the foul line, Fancher was inspired by watching the participant because she never quit. After seeing the women participate, Fancher came back to Valley and encouraged more of the seniors to participate in the activities. Despite the fact that more physical activity is the main goal of hosting the games, that doesn’t mean the games lack any intensity. One time during the basketball throw, three participants made 15 of the 21 attempts. The top three participants then had a shootout for who would get each medal and every competitor wanted the gold. Any senior who still wants to participate in July and August’s games at the center can visit the front desk to get an application and register. The community center is open from 5 a.m. to 9 p.m. on Monday through Friday, 8 a.m. to 8 p.m. every Saturday, and 1 p.m. to 5 p.m. every Sunday.